CORAL Magazine, the American version of the popular German publication KORALLE, is easily one of the best aquarium related print media around. It has been a staple read amongst saltwater hobbyists since its debut in 2009 (seems like it has been a lot longer than that) and it is always full of articles written by experts, along with stunning imagery to fill the pages. 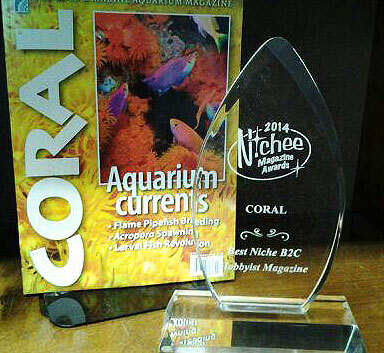 For its efforts, CORAL Magazine was recently awarded the title Magazine of the Year in the 2014 Nichee Magazine Awards. Dubbed the Oscars by small publications, the Niche Media awards ceremony took place in Charleston, South Carolina on February 26th. CORAL took top honors in the Hobbyist Magazine category, adding yet another notch to an already long list of accomplishments. According to the statement by Reef2Rainforest, the publication company that puts CORAL Magazine and AMAZONAS Magazine, the freshwater version, CORAL has reached a worldwide audience of 37,000 readers and is currently the leading marine aquarium magazine in the world. We would like to congratulate CORAL Magazine and all of its staff members, writers, and photographers on this huge accomplishment. Keep up the good work gang. Brandon, thanks for sharing our joyous news! Love, no, LOOOVE coral magazine. I wish they released it once a month instead of every two months. Apart from that, it’s an awesome magazine and congrats on the award!